Mending socks is quite a classic in textile repair. Holes are easy to come by, fixing them is not very hard. 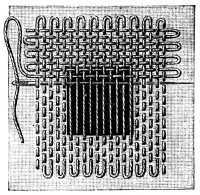 You darn a sock, you try to re-weave the weave, reconstituting or trying to rebuild/resemble the original structure. Fabienne took some photographs before and after her repair. Notice that in her socks, the toes are the culprit. A darning egg must be made of a wood which is not too hard, or not so soft, to spare the egg and the handler of the needle. * A darning egg is an egg-shaped ovoid of stone, porcelain, wood, or similar hard material, which is inserted into the toe or heel of the sock to hold it in the proper shape and provide a firm foundation for repairs. When the repairs are finished, the darning egg is removed. A shell of the tiger cowry Cypraea tigris, a popular ornament in Europe and elsewhere, was also sometimes used as a ready-made darning egg. * A darning mushroom is a mushroom-shaped tool usually made of wood. The sock is stretched over the curved top of the mushroom, and gathered tightly around the stalk to hold it in place for darning. Most people darn quite freely, improvising as you go along, feeling the hole, stretching the sock. There are however very strict darning techniques, which one day I’ll hope to see live. For all the photographs of the socks – a bit bigger, go to this gallery. This entry was posted in Re/touches, Splinter Fields, Workshop and tagged holes, photographs, repair, socks. Bookmark the permalink. Both comments and trackbacks are currently closed.